You probably don’t know this, but June 14th is the World Health Organization’s worldwide day for blood donation. In observance, let’s take this opportunity to photograph an unlikely subject: blood. Photograph blood. It can be real or fake. Human or hamburger or plant or a body of water during a red sunset or just good old cornstarch and food coloring. Just follow the theme in some way. It should go without saying, but please do not cut yourselves or anyone else for this challenge. If you’d like to photograph your own blood, why not just go to a blood bank and donate it in a safe and sterile environment? With that PSA out of the way, you may be surprised, there aren’t a lot of tutorials for photographing blood! It’s remarkably taboo, and no doubt, mostly tied to acts of violence. But what about making blood? Oh boy, there’s loads of information on that! Check out this guy’s recipes—most of them edible, complete with Kool-Aid and chocolate syrup. Our lead shot is by Mattia Belletti. It’s a remarkable bit of macro photography, isn’t it? That wrinkled skin juxtaposes against that perfectly smooth droplet. It’s both grotesque and beautiful. 0. No watermarks. They’re so ugly. 5. Include 970px wide image (200KB or less) AND a native resolution sized shot in email. 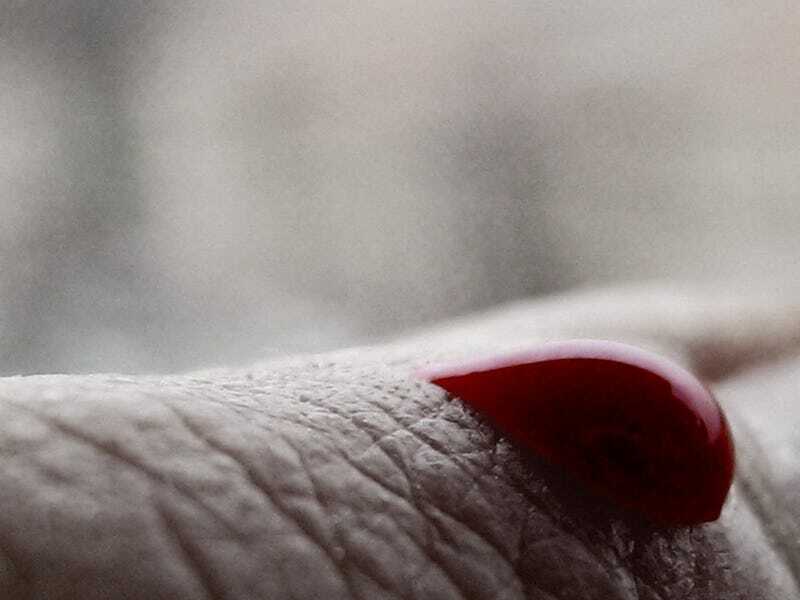 Send your best photo by Monday, June 15th at 10AM Eastern to contests@gizmodo.com with “Blood” in the subject line. Save your files as JPGs, and use a FirstnameLastnameBlood.jpg (970px wide) and FirstnameLastnameBloodWallpaper.jpg (2560px wide) naming conventions. Include a story of the shot in a few sentences. And don’t skip this story part because it’s often the most enjoyable part for us all beyond the shot itself!